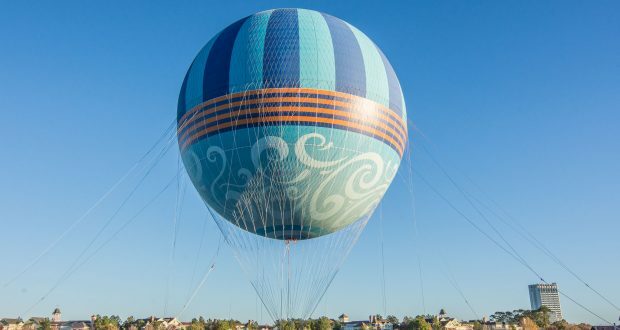 Have you noticed the huge blue balloon near Starbucks at Disney Springs? It’s certainly difficult to miss. The Aerophile tethered helium balloon is open to the public and offers 10-minute “flights” throughout the day. If you’ve never experienced this attraction, also referred to as “Characters in Flight,” you’re missing out. Here are six things to know about this fun family attraction. 6. The Aerophile balloon is big! Everything is just bigger and better at Walt Disney World, and the Aerophile balloon is no different. The big blue balloon is the largest tethered helium balloon in the world. It holds 210,000 cubic feet of helium, and the gondola (basket) spans 19 feet in diameter. It can accommodate up to 29 Guests in addition to the Aerophile-certified pilot. 5. It was made just for Disney World. Did you know the balloon is scheduled to change its design every four years? The most recent change took place at the start of 2017 and is the current blue color pallet you’ll see floating in the sky. The balloon before this one, and where the “Characters in Flight” originated, was designed and constructed specifically for Walt Disney World by Aerophile, S. A. in Paris, France. The balloon featured the silhouettes of different Disney characters whose stories involve flight—Peter Pan, Tinkerbell, Buzz Lightyear, Dumbo, Aladdin and other beloved characters. While the current blue balloon is beautiful, we can’t help but miss the “Characters in Flight” balloon design. 4. The view is amazing! From 400 feet up in the air, you and your family will enjoy breathtaking views of the Walt Disney World Resort, including the theme parks and Disney Springs. Visibility on a clear day can be up to 20 miles. The 360-degree view of everything around you is beautiful! Visibility is dependent on current weather conditions. 3. You can get married in the balloon. If you’ve ever dreamed of exchanging vows four stories up in the air, the Aerophile balloon is a great choice! Wedding packages are available and include an officiant, wedding florals for the bride and groom, a wedding coordinator and one hour of professional photography with unlimited shots. You can even add a limousine to the package, as well as professional videography and more. The wedding ceremony lasts 30 minutes, and you can invite up to 27 guests to share in your big day! The cost for the 10-minute ride is $20 for adults (ages 10 and up) and $15 for kids (ages 3 to 9). Children ages 2 and under are free. But Aerophile does offer discounts. Take a flight before 10:00 a.m. and the cost is only $10 per person. Discount coupons are available online at www.charactersinflight.com, and occasionally, Groupon offers discounts on tickets. 1. Weather plays a big role. If you’re planning to enjoy the Aerophile balloon at Disney Springs, be sure to check the weather forecast first. That’s because the balloon does not operate in inclement weather. This includes rain, thunderstorms, lightning storms and high winds.